We fabricate all our own steel concrete moulds for our own concrete production and we manufacture custom steel moulds for once off projects, specialist construction projects, and archtectural design details. Moulds for precast concrete tanks are something we excel at, but we can also manufacture smaller and/or more detailed moulds to your specification. Custom made products can be shipped worldwide. Send us your drawings to get a free quotation. For architects, builders and homeowners we can make a custom mould for you and manufacture the final concrete product here in our plant in Clonroche, producing a customised concrete product for you. 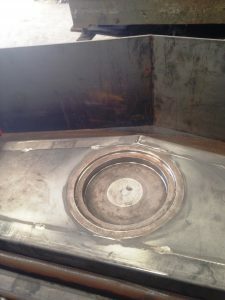 Our mould fabricators are highly experienced and have created moulds ranging from highly detailed architecture designed products to formwork for large concrete tanks. We can discuss your designs with you before manufacturing begins, and advise you with any queries you might have. Call us today – See what we can do for you.